MG Motor India is a fully-owned subsidiary of China’s largest carmaker SAIC Motor Corporation, which is ranked 36th in the Fortune 500 list. Founded in the UK in 1924, Morris Garages vehicles were world famous for its sports cars, roadsters, and cabriolet series. 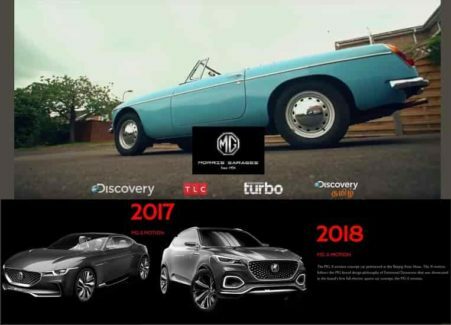 MG Motor India has announced the launch of its first-ever documentary “The Art of Motoring: The Morris Garages Story”, which encapsulates how the iconic brand’s rich legacy was built over the years and changed the world of sports motoring, forever. The documentary is part of a series of brand-building initiatives undertaken by MG Motor India to spread consumer awareness around its first vehicle launch in Q2, 2019. The 46-minute documentary will premiere on Discovery Channel on September 24 at 19:00 hrs. “The documentary aims to educate consumers on how the MG brand was established in 1924, starting as a performance-tuning outfit for Morris cars, and later how its roadsters became the most loved cars for celebrities and even the British Royal Family. We at MG Motor India are proud to have created this documentary which shows the feelings of emotions, love, passion, culture etc. associated with the MG cars – for consumers in India and around the world,” said Rajeev Chaba, President & Managing Director, MG Motor India. The documentary also takes a closer look at MG’s record-breaking racing milestones in each decade and how the Octagonal badge has remained resilient despite various ownership changes. The narrative of the brand is built through the MG Car Club (MGCC) established in 1930 and its experienced members and classic car owners. The documentary has been produced by Blue Mango Films LLP, a production house based in New Delhi. MG also plans to use digital and other platforms to sustain the content and amplify it including a pre-screening for select influencers. MG Motor India is a fully-owned subsidiary of China’s largest carmaker SAIC Motor Corporation, which is ranked 36th in the Fortune 500 list. Founded in the UK in 1924, Morris Garages vehicles were world famous for its sports cars, roadsters, and cabriolet series. MG vehicles were much sought after by many celebrities, including the British Prime Ministers and even the British Royal Family, for their styling, elegance, and spirited performance. The MG Car Club, set up in 1930 at Abingdon in the UK, has more than a million loyal fans, making it by far one of the world’s largest clubs for a single brand. MG has evolved into a modern, futuristic and innovative brand over the last 94 years. With plans to soon introduce its brand of vehicles in the Indian market, MG Motor India has commenced its manufacturing operations at its car manufacturing plant at Halol in Gujarat. The first of these modern MG cars will be made available to the Indian customers in the second quarter of next year.